One of the most interesting prospects of the game was seeing how Arda Turan would fit into Barcelona’s 4-3-3 which has seen a nearly identical selection, especially in midfield, in the recent past. Unsurprisingly he took Rakitic’s place on the right side of the midfield as the Croatian started on the bench, though Arda’s role was slightly different. At his previous club Atlético Madrid, Turan was a key member in Diego Simeone’s system which brought them league success and saw them reach the final of the Champions League. Generally playing on either side of a 4-2-3-1, 4-4-2 or 4-5-1, his technical ability particularly in dribbling and pressing was crucial on both sides of the game for Los Rojiblancos. Within this shape, Arda and the opposite winger would play within the half-spaces and combine in a centrally-focused attack. This was where Arda’s quite unique skillset would come into the balance – his dribbling ability gave him much-needed pressing resistance as he could act as a needle player within opposition defences. This not only heightened Atléti’s ability to play centrally but he could individually open spaces, alongside Koke, for opportunities to break the last line of defence. A s for Atlético’s famous defensive system, Arda’s role on the flank of the midfield was crucial and one of the more unique aspects Simeone implemented. Unlike most defences, Atlético’s wingers would come very narrow in defence and act in their respective half-spaces. This position provided great strategical strength as they could not only support the two central midfielders to the best of their ability, but still be in a position to react to any wide attacks too. Because of the defensive requirements of these two key positions, Arda (and Koke) fit well as they both possess high intelligence. The two wingers would be pivotal in not only providing stability and central control through supporting the central midfielders, put also in much more attacking aspects such as the formation of pressing traps both centrally and laterally. An example of this was in their CL victory over Chelsea on route to the final. Considering his inside-oriented role in the capital, it was little surprise to see Arda implemented in a central midfield role at Barcelona, whilst he potentially offers a first-rotation/back-up option for either of the two wing positions. Against Espanyol, Arda took on Rakitic’s role with some variance in his attacking movement and play. Similarly to his teammate, we could see him situationally balancing the movements of Messi yet it was much less frequent, whilst the Argentine footballing-god stayed closer to the touchline. He also made some dropping movements onto the same line as Busquets, which Rakitic sometimes does too. From this position he would offer as an alternative option to beat the first line of pressure though he didn’t look totally comfortable there. It was interesting to see this as during build-up at Atlético, Arda took on a higher position whilst it was the opposite Koke who would be oriented deeper. Another similarity was his consistent forward movements in the right half-space, as he had the freedom to take on a high position amongst ‘MSN’. As he moved to the right touchline less than Rakitic however, he probably made this forward movement on a more regular basis, and was situationally balanced by a dropping Suarez. Here we can see Arda up against the Espanyol defensive line whilst Suarez drops. The Turkish needle player was quite ball-oriented with his movement when the possession was down the left, and would shift all the way over to the left half-space in some cases. This action served to allow support in combinations and use his passing ability to free the likes of Neymar and Messi into dangerous isolation situations. Perhaps the biggest difference from the Croat he replaced was the individual orientation of the midfielder. In a system heavily based around maximising the huge attacking potential of the front three, Rakitic’s role is to support Messi through balancing his inside movements and further integrate him into the attack. On the other hand, Arda’s role was much more individual focused which was epitomised in the frequency of his dribbling which, albeit wasn’t to the extent it was under Simeone, was still an increase on Rakitic. 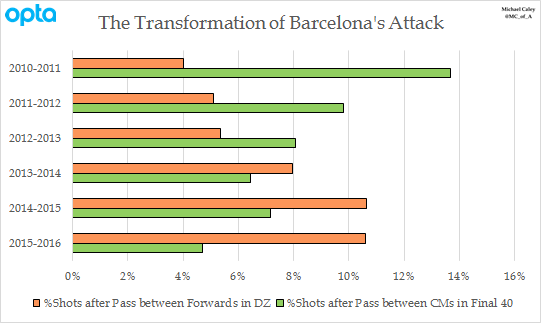 This created a few good situations in Barcelona’s individually-focused attack and Messi was still ever-influential amongst the best ‘front 6’ in football. Turan’s addition could act as a nod to the shifted approach of Barcelona’s attack from a collective-focused one to what it is now, based much more upon individuality and the incredible ability of the front three. As Michael Caley’s analysis shows, Barcelona have shifted drastically from the force they were under Guardiola and instead of being a team focused on collective play around the guidelines of Juego de Posicion, they are now much more based around emphasising the individual abilities they possess. Another, click on the image to be taken to the article in a new tab. Much of the possession game at Barcelona however is getting the most out of the front three, particularly Messi as Enrique said recently, “What we look for as a team is that Leo participates in the game as much as possible.”. Whether it be through the balancing movements of Suarez or the team simply trying to give him the ball as much as possible, Lucho has shifted the focus to emphasising individual quality. Their abandonment of positional play, which is something which has progressively developed since Tata Martino took over, has had some negative effects. The positioning is much less consistent and isn’t at an as high level as we have previously seen, whilst the circulation of the ball is much less patterned and more variable. However it is difficult to say that we would’ve seen such a jaw-dropping trio flourish had the change not happened. An example of the sub-optimal positional structure can be seen immediately before losing possession for the first goal. Barcelona’s structure before losing possession for Espanyol’s goal. You can really see how the bad shape of 4 players on one line and 3 on another makes progression of the ball very difficult and unsurprisingly the ball is turned over. In a particularly heated match, Espanyol were particularly aggressive in defence and in some cases had the intentions of hurting players such as Pau Lopez’ threat at Messi. The away side used clear man-orientations in their defence as they looked to be aggressive in imposing themselves on Barcelona as a number of teams do. Obviously this failed to be a successful approach as Barcelona manage such match-ups impressively and were able to beat the man-marking defence through their excellently-quick combinations through the final third. For the most part, Espanyol were rather compact in their 4-4-2 and would be reasonably narrow from winger to winger. However this was not paired with a good level of defensive access and therefore they struggled to enforce effective pressure on the ball in some key situations. Without pressure, Barcelona were able to exploit such situations through the playmaking abilities of the central midfield trio whilst their abundance of needle players in attack helped them counteract the impact of Espanyol’s compactness. Their inability to form an accurate press came particularly when the ball was in a half-space. This not so much highlights Espanyol’s weakness as it does the strength in attacking variability which the half-space provides. From the wing, the nearest space you can access is the half-space – from the centre, you are flanked by a half-space on either side of you. However when the ball is in the half-space to begin with, you are flanked by a wing and the central corridor. The difference here is that the wing are two largely different spaces offering much different attacking possibilities. In the scene above, Espanyol are hesitant to press Alba as they have to keep track of Neymar on the wing as well as Suarez and Arda lurking towards the centre, all whilst Iniesta is free for a vertical pass. Because both a wing and the centre can be accessed in this one instance, Espanyol struggle to prepare for Barcelona’s next ‘move’ due to the attacking variability they possess. Without that level of anticipation, they fail to form a press and Iniesta is found within the lines of midfield and defence. After conceding early on, Barcelona almost inevitably pulled it back through another masterful performance from the front three. It was intriguing to see how Arda fit into the system and he made a solid start to his career after leaving Madrid last summer. The signing is quite an intelligent one as he not only provides an option for both central midfield slots (with an ageing Iniesta) but can also support with cover for both Messi and Neymar whilst providing strong defensive abilities too. This Barcelona is obviously built around MSN – and not just from a tactical perspective, but from a marketing, squad-building and even presidential focus (Bartomeu bases a lot of Barca around the current MSN). They play much more adrenaline football as I like to call it. They take risks, they attack, attack and attack. Enrique introduced more defensive pressure, or should I say re-introduce due to Martino forgetting what Tito and Pep had in terms of defence, however Enrique sacrificed some positional superiority in favour of individual. 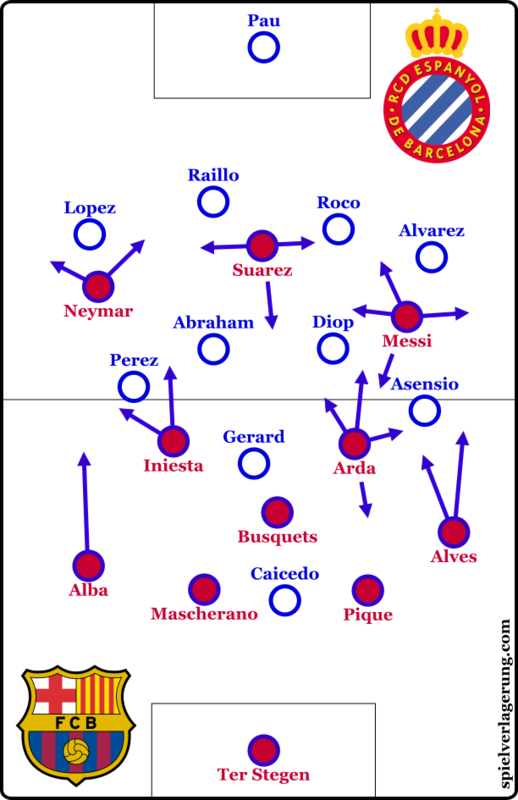 Just look at the image you showed about Barca’s structure before the turnover. There is a distinct line between the midfield and the forward line. This is because I think Enrique wants his players (more particularly the MSN) arriving into the space rather than positioning themselves in the space. This allows for greater individual movements and moments, thus maximising the talents of players such as Messi, Neymar, Iniesta, Arda, Alves when he cuts in and Suarez when he drops back because normally he leads the line. This is just my view, I wonder if you think the same or if there are other reasons perhaps? Great article, Tom! This Barcelona is obviously one of the most interesting teams to watch if you are looking for beautiful football, but that is mostly due to the insane players they have and some mechanisms that still remain from Guardiola’s time. Luis Enrique is a great coach nontheless, but their positional game is a mirage when in comparison to the best Barcelona(Guardiola’s, obviously). This style might integrate some of the players better(although I doubt that as well), but the team’s ability to solve problems in a collective way suffers a lot from that positional anarchy. On another subject, I know you here in Spielverlagerung are familiar with Jorge Jesus’ work at Benfica. Well, this summer he has moved to their biggest rival, Sporting CP(to my greatest happiness 🙂 ), and the football Sporting is playing right now is some of the best in Europe, in my opinion. The last match vs Vitória FC was particularly impressive, in a collective point of view, I think you’d have a good time watching it. Also, Sporting will play against Leverkusen in the Europa League, so it would be a good opportunity for you to know one of the German teams’ opponent.